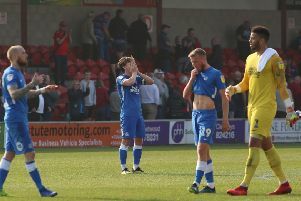 Posh star Marcus Maddison is a target for Premier League clubs. Premier League side Sunderland are interested in signing Peterborough United star Marcus Maddison, according to Sunday newspaper reports. The Football League paper has splashed on the Black Cats interest in Maddison today (August 30). And Posh Director of Football Barry Fry is quoted as saying the 21-year-old will leave before Tuesday’s (September 1) transfer deadline if a big enough bid is received. Bournemouth and Leicester are other Premier League clubs to show an interest in Maddison. Posh signed him from Gateshead for around £200,000 just 12 months ago. Attacking midfielder Maddison is a former Newcastle Academy player. He’s scored 12 goals for Posh (four this season) in 37 appearances (six as a substitute). Former Posh players Lee Tomlin (Bournemouth) and George Boyd (Burnley) have both recently played in the Premier League and both were signed by Posh from non-league clubs.